December | 2014 | Landscapephotography etc. Personal favorites of 2014. Post #4. Bavaria. For the last of my 2014 favorites postings I have selected a few images from my autumn trip to Bavaria and the German Alps. I have shared all these images before here on my blog, so I won’t bother you with repeating the story behind them. The trip to Germany exceeded all my expectations. I was really fortunate with the autumn colors and the weather. I hope to return to this region soon, maybe already next autumn. This concludes my 2014 favorites postings, and it only remains to wish you all a happy and prosperous 2015! I will be back next year with more images, so stay tuned! As this year is coming to an end, it is time to recapitulate and summarize 2014. We are all getting older, but as a friend of mine often says, it is better than the alternative. A few more wrinkles but many experiences richer. For me, this has been a great year with so much joy, happiness and love. I am a very fortunate guy! Photographically, 2014 has also been pretty good. I have had the fortune of visiting amazing locations such as Venice, California, Arizona, Utah, Nevada, Bavaria and the German and Austrian Alps, Thailand and numerous places in Norway and the other Nordic countries. Furthermore, I have been pretty lucky in a few photographic competitions with gold medal in Trierenberg Supercircuit special themes, a gold and a silver medal in PX3, bronze medals in Epson Pano Awards, several honorable mentions in International Photography Awards, a 3rd place in B&W Spider awards etc. It is not easy to rank these, but at least what surprised me the most was the silver medal in the professional press/travel section of Prix de la Photographie Paris for my Tuscany-portfolio. However, the most important thing is that I have made a few images that I am happy with this year, and my plan is to present them one after one in single postings in the next days with a little story around how it was captured. As any photographer knows, picking personal favorites is a difficult task. My choices are very personal, and of course influenced by my connection to the subject matter, what happened before and after the capture and tons of other personal stuff. But hey, that’s the way it is! 🙂 BTW, these images come in random order. Picking some images are difficult enough and ranking them… well that’s impossible for me. In the end of august 2013 I made an image I titled “the last summer night”. When the summer of 2014 emerged I planned to make a similar image titled “the first summer night”. I used the last days of may to scout locations and plan this shot. When june 1st approached, the weather was perfect, the subject matter was just as I had imagined and the moon was in the right place. I got exactly what I hoped for, and thus, this is one of my favorites from 2014. Hope you like it too, stay tuned for more! I haven’t been able to post as much here as I hoped or planned for this month. My apologies. I have been out travelling (and still am, kind of..) for 4 of the last 5 weeks. And as always, travelling makes some logistics more difficult, e.g. access to image archives (which are locked down in my safe when I’m not home) internet access, editing images on laptop screens etc. Well, enough excuses. Here is my first christmas-posting this year. I’m currently in the northern parts of Norway, visiting friends and family. Where I am right now, the sun is below the horizon these days, but will be seen again in early january. Furthermore, the skies have been clear and the moon mostly invisible. This means that nights are long and very, very dark. Couple that with a latitude that often sports aurora borealis, and it is given what I have been up to every night this so far this christmas. Shooting the aurora is not very challenging, technically. I basically use the same settings as I do for starry-sky photography, maybe a little lower iso, as the aurora lights up the land somewhat. Iso 1600-3200, f 2.8-4 and an exposure-time of 10-20 sec mostly give nice results. I prefer to use a very wide-angle lens to capture as much as possible of the skies. The challenging part is to find an interesting foreground and wait for the aurora to appear and match the foreground. Although I am born and raised in this area and more or less know it like my own pocket, it is still extremely challenging when it is so very, very dark. Also, handling the cold may be a problem. Using live-view for hours when temperatures are below -10 deg c may be a problem. And good, warm shoes and clothes are a must! Anyway, I got a few images, both of aurora and deep starry skies. 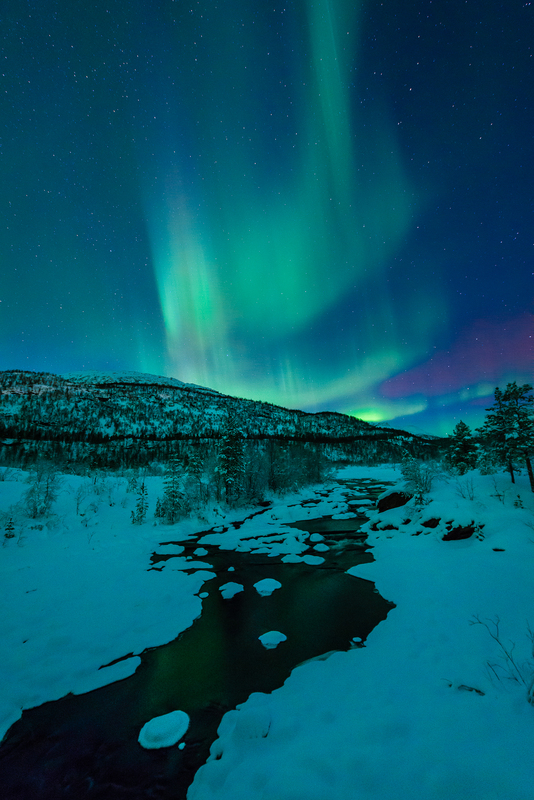 This particular image was captured at around 5 am in Valnesfjord, Norway, dec 22nd. I used one of my d800 bodies and the nikkor 14-24 @ 14 mm. Exposure setting were iso 2500, f 4.5 and 10 sec. Hope you like it, more will come! I wish you all a wonderful Christmas and hope for peace and prosperity for all of you! I am currently out travelling and photographing south-east Asia again. This is an image from the west-coast of Thailand, capturing the green waters of the Andaman sea at dawn the other day. Hope you like it, stay tuned for more! Ps this has only been edited on my laptop and not on one of my calibrated large-format screens. Thus, it is definitely not ready for publishing in my gallery or for sale yet, but it will be edited properly as soon as I get back home!